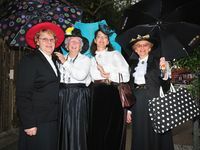 THE Fraser Coast's “ultimate family festival” enjoyed another successful showing yesterday, as nannies, chimney sweeps, admirals and town criers took over the centre of Maryborough. Mel Evans, the event co-ordinator of the Mary Poppins Festival, was thrilled with the turn-out. “About 10-12,000 people would have attended,” she said, a number consistent with previous years even though storm clouds loomed ominously overhead throughout the day. “It's great it was so well supported again,” she said, especially happy with the level of interest shown by the youth of the region. 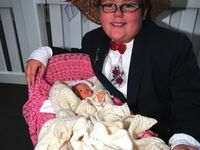 So many children entered The Great Nanny Race that three heats were needed before the field could be narrowed for a final race. 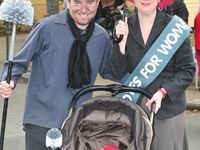 Contestants jostled and joked their way through the good natured Celebrity Nanny Race, with Chronicle Editor Peter Chapman the first across the line only to be controversially denied by the judges for “obstruction”. Verity Hunt-Ballard, who plays Mary Poppins in the musical currently showing in Sydney, was one of the judges and was impressed by what she saw. “It's an absolute hoot,” she said, after seeing a number of future Mary Poppins musical stars in the costume. 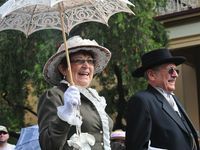 The large crowd enjoyed the Grand Parade of people in full period costume, the Town Crier and Chimney Sweep competitions and rides on the steam train. Even the weather came to the party for the festival, with the rain holding off but still offering grey skies for the perfect London backdrop.